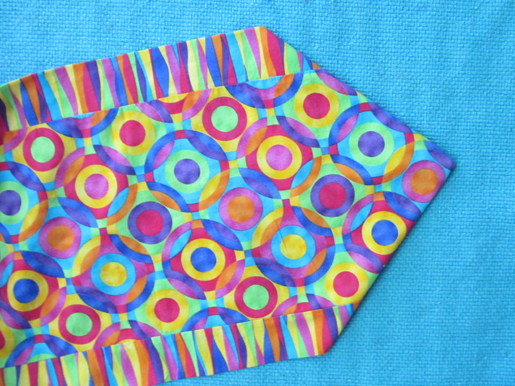 You really can make this table runner in just 15 minutes! 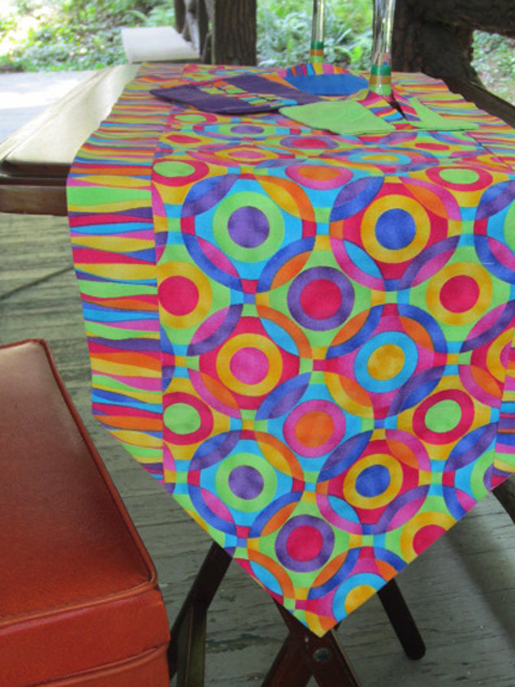 Two coordinating fabrics + four straight lines of stitching + a good pressing = new table decor. Add a set of Betty’s Wine Glass Slippers and you have a great last-minute house-warming or shower gift. Step 1) Sew the seams. With right sides together, sew the long edges of fabric #1 and fabric #2 together to make a tube. Fold the tube in half lengthwise, matching the seams. Press lightly to create guidelines through the center of each strip. 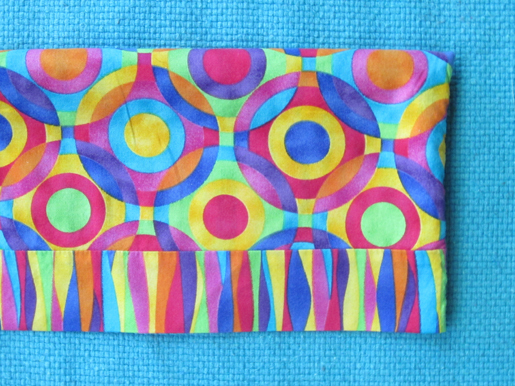 With the tube still folded, sew the ends closed, leaving a 3″ opening at one end for turning. Step 2) Fold the runner. Using the 3″-long opening, turn the tube right side out. 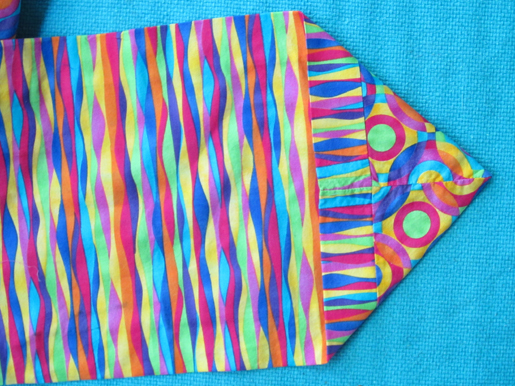 Fold the tube lengthwise, matching the long seams. With fabric #1 (center strip) on the outside, tuck fabric #2 (borders and backing) inside, matching the corners of fabric #2 to the inside corners of the fold. This results in a long rectangle. At one end of the runner, grasp the edges about 5″ from the corner. Pull away from the center, opening out the end to form a triangle. Repeat for the other end of the runner. With fabric #1 on top, match the lightly-creased center guidelines of fabric #1 and fabric #2. Fabric #2 will form borders along each side of the center strip. Press, ironing out the guidelines, using steam if needed. Tip: This runner is a wonderful canvas for topstitching, decorative stitches, embroidery and applique. Embellish the center panel, leaving 1/2″ on each side for the seam allowances, then construct as above. Tip: Would you prefer a narrower or wider runner? The instructions are for a 9″-wide center strip. 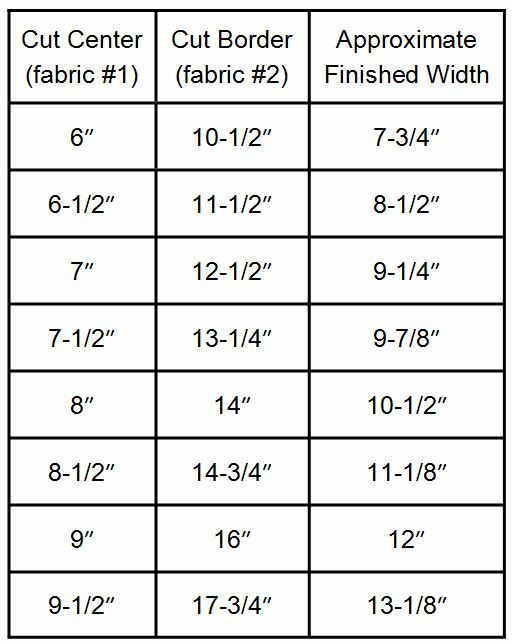 I wanted to make different sizes based on fabric repeats, so I created this table. Please tell us about the fabric. It’s so colorful. I bought the fabric at Joann’s a couple years ago. 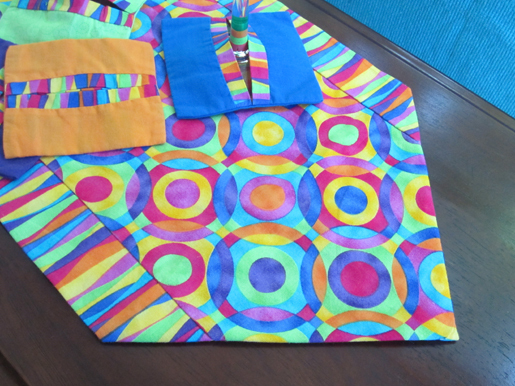 I went on line and found they still have some, the link is http://www.joann.com/quilter-s-premium-fabric-ener-geo-circle-brights/10699254.html#prefn1=isProject&start=101&sz=54&prefv1=false and it’s on sale too!